These award winning systems come with everything you need to grow and you wont have to grow it alone. SuperCloset offers lifetime customer service and grow support to ensure your first grow is a success and every grow you have is better than the last. SuperCloset is the worlds leading manufacturer of the #1 selling Grow Cabinets and Grow Rooms in the world. They have garnered more awards for their indoor grow systems than any other company in the indoor gardening industry. Once again they have taken the top spot for the High Times STASH Awards by winning the Best Grow Box 2017 category with their impressive SuperTrinity LED Grow Cabinet system. The SuperTrinity LED gets its name from the simple yet effective inclusion of three separate growing chambers and the use of the Award Winning Best LED Grow Light Innovation 2017 KIND LED Grow Lights. 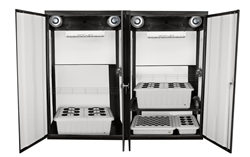 This grow cabinet is the largest Grow Box on the market and will yield upwards of 2 lbs of dried plant matter every 4-6 weeks, or 4 lbs every 8-12 weeks depending on your growing method. Having three separate chambers allows indoor growers to clone or germinate, veg and flower all at once to complete a full continuous cycle in the comfort of their homes. All SuperCloset Grow systems come with custom odor scrubbing technology for those pesky garden aromas and your indoor garden can remain safe from prying eyes with the three pin locking doors. These award winning systems come with everything you need to grow and you wont have to grow it alone. SuperCloset offers lifetime customer service and grow support to ensure your first grow is a success and every grow you have is better than the last. To check out the SuperTrinity LED and all of the award winning systems SuperCloset has to offer, visit supercloset.com and speak with one of the grow support technicians today. They are sure to find the perfect solution for your indoor gardening needs.